The IR829 router is a rather interesting beast, it has 4G, wireless, GPS, an accelerometer, water resistant, fanless, gigabit switchports + WAN and vehicle ignition system features. It's also got the ability to run VM / containerised services within a small linux environment on the router itself. This post will serve as a dumping ground for stuff I've found out when having a play! There's no standard RJ45 console port, the device comes with a USB cable which plugs into the router. You'll need to undo the small panel at the top end of the router held in place with two screws. This will give access to the console port, the two SIM card slots and the reset button. You can then use screen (or whatever terminal program you prefer). I had to use the /dev/tty.SLAB_USBtoUART3 line. The router will take some time to power up the next time it's reloaded as it will perform the upgrade on all the components. This is a hidden command so you'll have to type out the whole thing. [Cellular0]: Please ensure NMEA is enabled in order to get all satellite and GPS location information! This router has the ability to host a small linux appliance. This is internally connected to the router on internal interfce Gig5. Starting Guest OS ...... Done! By default the user is root with no password. However I've already configured aaa authentication on the router for SSH and so you have to use your local username and password to login. To disconnect from the console push CTRL+SHIFT+X then push the number 6 on the keyboard. You'll be returned to the router prompt. You must then type disconenct or if you hit enter a couple of times it will put you back into the session! Once you have the IOx instance running and happy, you can connect to the linux server behind the router using it's web GUI. First check for the address in a show ip dhcp bind or use ifconfig from within the telnet session described earlier. The IR829 has a built-in access point you can use. 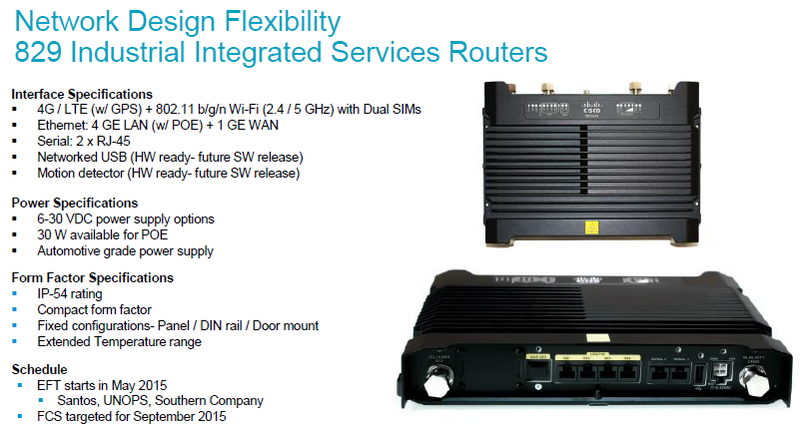 Similarly to other 800 series routers and ISRs you must configure the access point separately to the router. This has the advantage of the AP being able to run in autonomous mode (by itself) or lightweight (with a controller). Then you can connect to the console using the service-module wlan-ap 0 session command. You'll have to do use the whole CTRL+SHIFT+6 then hit X to detach from the terminal then disconnect to close the session.